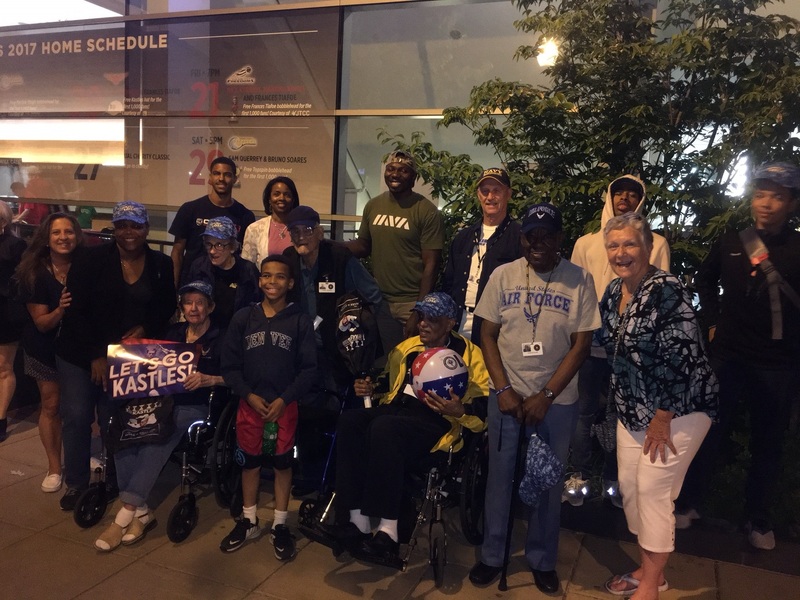 For the third time in the four years, Friends of the Soldiers Home partnered with Bloomberg to take residents from the Armed Forces Retirement Home-DC to a Washington Kastles tennis match. 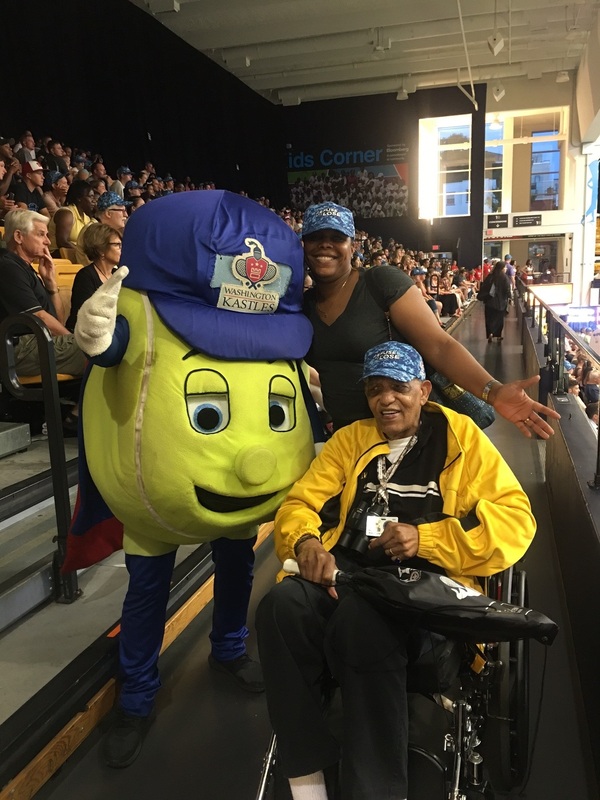 The Kastles lost the July 26 match against the New York Empire, 20-19, but that didn’t stop everyone from having a great time! FOSH thanks Bloomberg and the Kastles for supporting this event. Friends is also grateful to the volunteers who assisted. 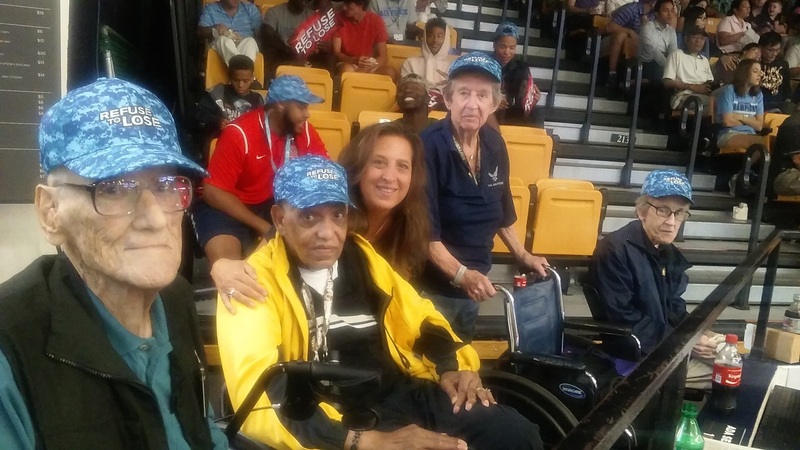 Above all, we thank the veterans of Soldiers Home-DC for all they have done. We are appreciative for the opportunity to show our gratitude! Photos courtesy of Lori Lincoln and Carol Mitchell. 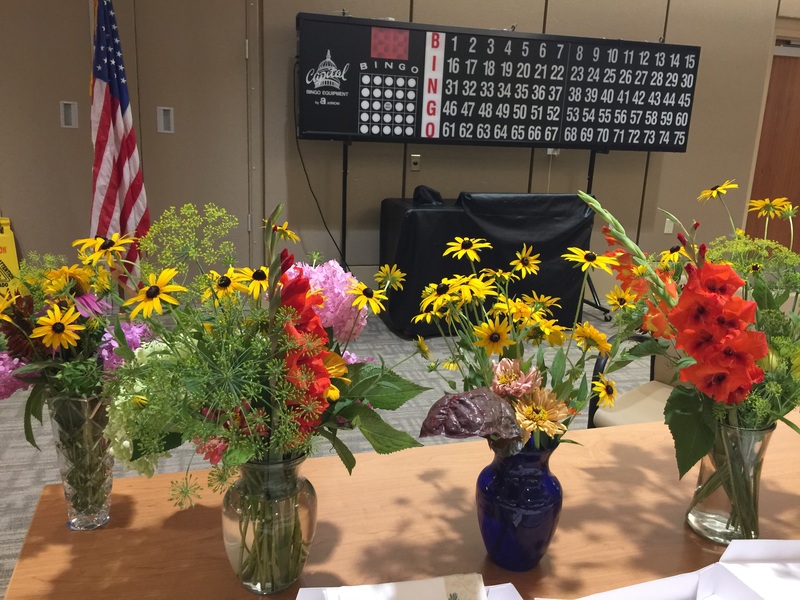 This summer, Friends of the Soldiers Home is having several events to “bring the garden to the residents” so that more folks can enjoy the beautiful flowers produced on campus. We kicked things off with a flower bouquet making event on a Saturday earlier this month. We brought large buckets of gorgeous flowers to work with, all grown at the garden or at gardeners’ homes. One resident lit up with joy when seeing the gladiolus – he told us about his wife who was a passionate gardener during her life and grew many of that type of flower. 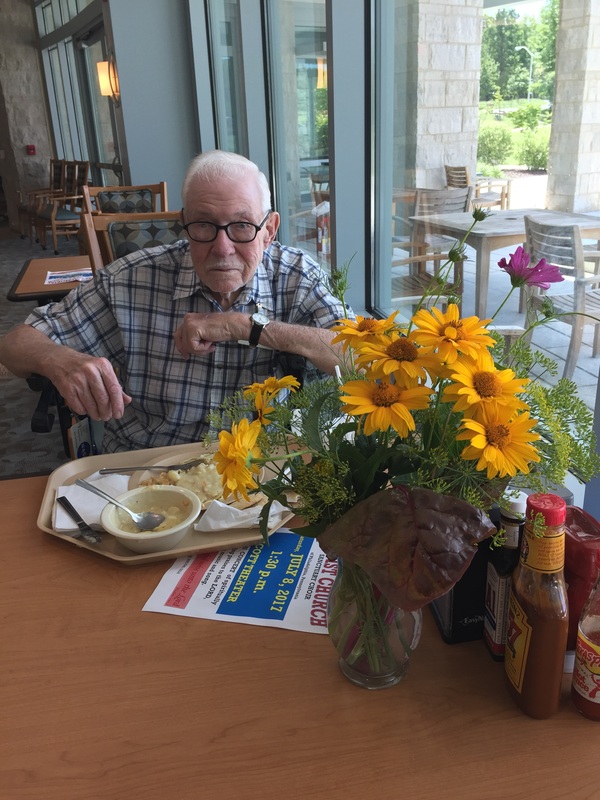 A few residents stopped in for the event, but we reached many more when we placed the bouquets on tables in the dining hall during lunch and in the coffee area. The fresh flowers were met with smiles and words of thanks. Volunteers Linda Cotton and Sarah Clinehens put on the event, and the flowers were contributed by Carol and George Herwig, Susan Minnemeyer, Linda Cotton, Sarah Clinehens and Scot Bohl. Next up will be a tomato tasting and a repeat of the fresh flower bouquet give-away scheduled for Saturday, August 19th. Friends of the Soldiers Home operates the volunteer garden program so that residents of Armed Forces Retirement Home-Washington have an opportunity to grow things on campus without doing too much of the heavy lifting. Story and photos by Sarah Clinehens. 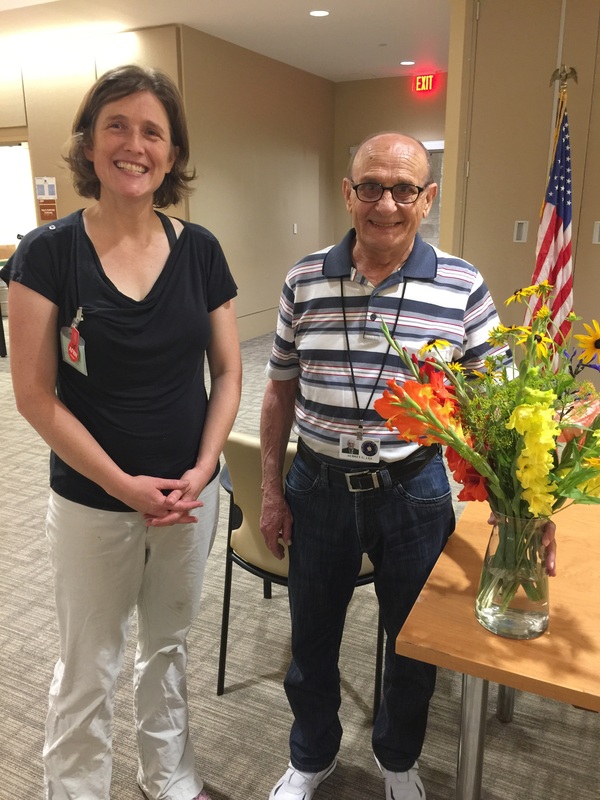 Geography was the theme when Friends of the Soldiers Home volunteered for its monthly Jingo game this month. Friends, or FOSH, is now in its sixth year of providing volunteers for this game, which occurs the second Thursday of each month. Some residents are unable to play the game unless volunteers help them get to it, and then help them play. If you would like an opportunity to serve veterans in this evening game, drop us a line at volunteerfriendsofsoldiers(at)gmail(dot)com. Our next game is Aug. 10! More than 3,000 people came to the Armed Forces Retirement Home on July 4 for a gala event that connected the community with veterans in celebrating America’s independence. The sixth annual gathering was the first one since 2014 that didn’t have significant rain — and hence, it was a record turnout. Large numbers of children loved roaming on the green expanse of the golf driving range. Many kids played in the bounce house while others competed in the contest for most patriotic outfit. Families enjoyed fishing at the well-stocked Soldiers Home pond. Adults mingled and enjoyed food and drink while listening to the Home’s resident DJ, Billy White, spin top tunes. Best of all, a record number of residents of the Soldiers Home joined in the celebration! Friends of the Soldiers Home is grateful to residents and staff of the Home, the Nam Knights Capital Chapter, Anheuser Busch and DCCX bike group for helping to make the event so successful. Photos by Lou Avenilla and Isabelle Hughes.